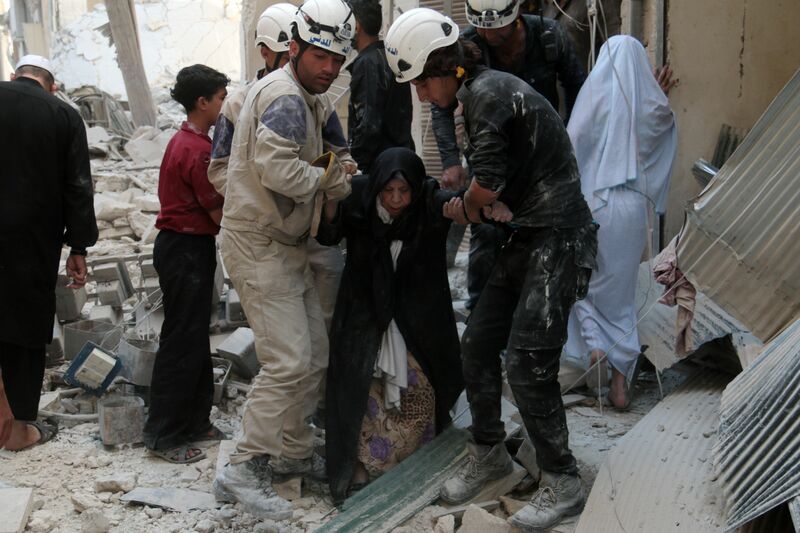 Emergency responders help an elderly woman following a reported barrel-bomb attack by government forces on the Shaar neighbourhood of the northern Syrian city of Aleppo on June 21, 2014. 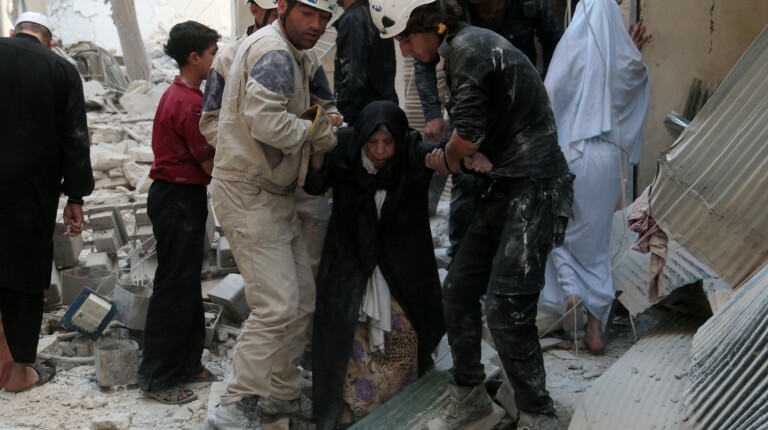 Syria’s war has killed more than 162,000 people and forced nearly half the population to flee their homes. Egypt’s permanent representative to the United Nations in Geneva condemned all human rights violation in the Syrian conflict, highlighting the need to end violence especially against civilians. Walid Abdel Nasr addressed the United Nations Human Rights Council during an “interactive dialogue” with members of the Independent International Commission of Inquiry on the Syrian Arab Republic, according to a Saturday statement from the foreign ministry. Abdel Nasr conveyed Egypt’s condemnation of “all violations of human rights… including the use of violence against civilians”. He called for “the withdrawal of all foreign fighters from Syrian territory”, which he sees as a “key element to defuse [the] violence”. The ambassador reiterated Egypt’s “demand for all parties to listen to the demands of the Syrian people and meet them” to prevent more bloodshed and the spread of the conflict. He also stressed the importance of securing “appropriate mechanisms for the delivery of humanitarian aid”. The Chair of the Commission of Inquiry, which was formed by the UN Human Rights Council in August 2011, said in a statement last week the “conflict in Syria has reached a tipping point”. He reported the use of torture, public execution, attacks on medical staff and “a massive number of war crimes and crimes against humanity”. The conflict continues to rage on and a political solution now seems even less likely since the resignation of Lakhdar Brahimi as the UN and Arab League’s joint envoy to mediate a settlement. Diplomats around the world have emphasised the need for all sides of the conflict to allow for the delivery of humanitarian aid in the conflict zones. Abdel Nasr stressed once more Egypt’s view “that a political solution remains the only option which ensures the unity of Syrian territory”.